Instant downloads of all 946 LitChart PDFs (including The Catcher in the Rye). Mr. Antolini has just had a party, and his apartment is full of glasses and dishes. Yet he welcomes Holden, and his wife heads off to make some coffee. The party symbolizes society; it's what Mr. Antolini can give Holden. Mr. Antolini questions Holden about his expulsion from Pencey and tells Holden that his father is very concerned about him. When Holden says he hates Pencey's rules and rigidity, Mr. Antolini points out that it can sometimes be more interesting to follow the rules and see what happens. Unlike other adults, Mr. Antolini doesn't throw phony catch phrases at Holden. He explains his point of view. Like Phoebe, he doesn't let Holden get away with his usual evasions. After Mrs. Antolini brings coffee and heads to bed, Mr. Antolini says he's worried that Holden is heading for a "terrible fall" that will result in a life of bitterness. Holden protests, but Mr. Antolini continues: the "fall" Holden seems to be heading for results when a man expects more from his environment than it can possibly offer him. He adds that mature people live humbly for realistic causes, while immature people seek to die for unworthy ones. Finally, he says that the feelings tormenting Holden are part of the human condition and have plagued countless young people. Mr. Antolini doesn't phrase his advice in terms of success. He understands that Holden thinks of success as phony, and that Holden isn't necessarily wrong to think that way. Instead, he tries to show the effects that Holden's alienation and too-high expectations have on Holden's happiness. Mr. Antolini also connects happiness with being a part of things, with responsibility and humility. Holden does his best to listen, but eventually his tiredness makes him yawn. Mr. Antolini makes his bed, and Holden falls asleep. Is Holden's tiredness legitimate, or another tactic of preserving his alienation? Suddenly Holden wakes. He feels Mr. Antolini's hand brushing his forehead. Mr. Antolini says he was just "admiring" Holden, but Holden is convinced it was some kind of homosexual overture. He says he forgot to collect his suitcase from a locker in Grand Central and leaves. Holden has been anxious about homosexuality from the beginning of Catcher, making it difficult to guess what Mr. Antolini is doing. Is Holden right or wrong? It's never entirely clear..
Kestler, Justin. "The Catcher in the Rye Chapter 24." LitCharts. LitCharts LLC, 22 Jul 2013. Web. 9 Nov 2018. Kestler, Justin. "The Catcher in the Rye Chapter 24." LitCharts LLC, July 22, 2013. 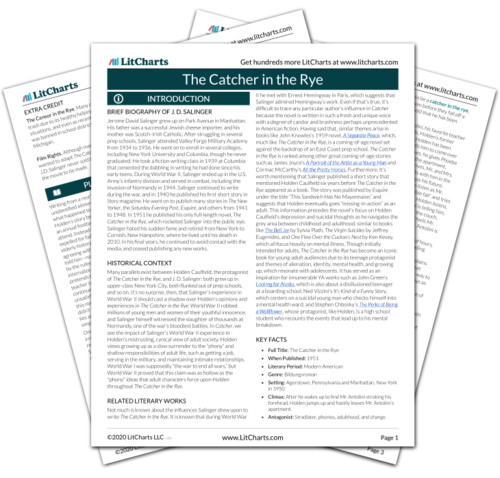 Retrieved November 9, 2018. https://www.litcharts.com/lit/the-catcher-in-the-rye/chapter-24.